We are coming into the home stretch of holiday cookies and goodies around here. I don't want to think about how many pounds of butter, flours, and sugar have been used in this kitchen the past month. I can't even calculate how many times the paddle of the KitchenAid has whirled around these weeks. Every day I am a little bit tempted to throw up my hands, put away the flours, and lie down on the couch. I know I promised you certain cookies, but I feel ready to drop. Then, I remember the kindness of the man here on the island who opened the door of his just-closed store to give me a USB cord to attach my camera to our computer. Lu had hidden ours somewhere, so we couldn't find it, and I needed to process photos to be able to post all those cookies the past week. His cash register was closed down, so he just gave the cord to me for free and a wave of his hand. We live in a small town. He figured I would pay him later. I did, of course. I also dropped off a batch of smoky bacon ginger cookies as a thank you. The look on his face convinced me to go home and bake again. So did the joy expressed on this Facebook post when I showed a photo of the gluten-free cannoli. Those will be here tomorrow. Today we have spritz cookies. And we're giving away a copy here today, to one lucky reader. Tell us about a small kindness that inspired you to give more. Let this be a warning to you: the recipe that comes with the kitchen tools you need to make that recipe? They generally stink. I know that now because I made a big batch of spritz cookies based on the recipe that came with the spritz press I just acquired. It was dry, stiff, and tasteless. And it all went into the trash bin. Danny and I persisted, however. We didn't want you to miss these buttery, slightly sweet lovely treats. If you've made spritz cookies before, and you have a spritz press already, pull it out. 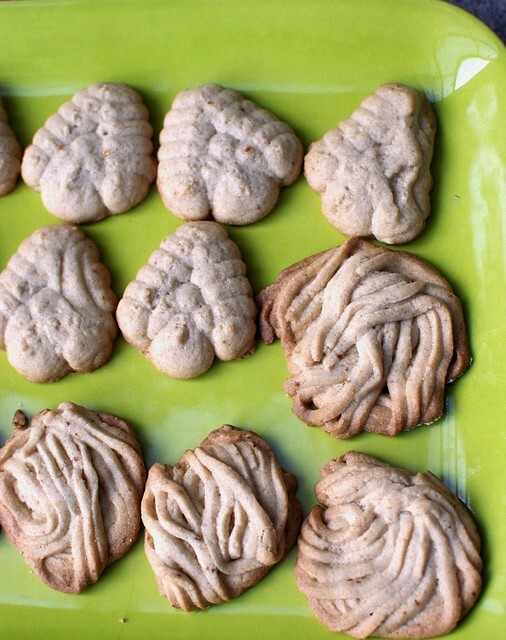 It's not too late to make these little cookies. And, if like me, you have never made these before, and you don't quite get the hang of the different disks and how to press them down on the baking sheet firmly, you can have little squiggles of cookies that look like piles of noodles! "Pasta cheese!" Lu shouted when she saw these, then ate one. Preparing to bake. Preheat the oven to 375°. Line a baking sheet with parchment paper or a Silpat. Combining the dry ingredients. Add the flour, xanthan gum, guar gum, and salt to a bowl. Whisk them together to combine and aerate the flour. Set aside. Combining the wet ingredients. In another bowl, whisk together the egg yolk, yogurt, and vanilla extract. Set aside. Creaming the butter and sugar. In the bowl of a stand mixer, mix the butter and sugar until they are light and fluffy, about 3 minutes. Stop the mixer and scrape down the sides of the bowl. With the mixer running again, add the egg-yogurt-vanilla mixture and beat until it is incorporated into the butter and sugar, about 30 seconds. Slowly, a bit at a time, add the dry ingredients. Mix until the ingredients are combined and form a dough around the paddle. Turn off the mixer and scrape down the sides of the bowl to combine with the dough and make sure there are no pockets of flour left. The dough should be pliable without being too soft, yet not too stiff. Baking the spritz cookies. If you have a spritz cookie press, fill the press with the dough. If the dough feels soft in your hands, refrigerate the cookie press for 15 minutes. Use the directions for your particular cookie press to find the best way to shape the cookies. If you don't have a spritz cookie press, you can press the dough through a pastry bag, using the tip of your choice. Put the cookies on the baking sheet, leaving two inches between them, until the sheet is comfortably full. Bake until the cookies are light golden brown and set, about 12 to 15 minutes, rotating the baking sheet halfway through. Allow the cookies to cool for 10 minutes, then transfer them to a cooling rack. Eat when there is not a smidge of warmth to the cookies. There are quite a few blogs that I read and follow, including yours of course. Many of our fellow bloggers are hosting giveaways this holiday season to raise money for charities! This is such a nice gesture of you all and made me wanted to do more to make this world a better place. There are so many people out there that are less fortnate than we do. So, we should all lend a helping hand to those around us whenever we could, not just during the holidays. Thanks Shauna. For heading back to the kitchen EVERY day to bake for us. It means the world to all of us. Merry Christmas to you, Danny an Lu. Thank you, thank you, thank you... I inherited one of these contraptions from a relative without any instructions and was contemplating throwing it away as I couldn't find a decent recipe. I'll be trying these out for sure! The small kindness that caused me to give more is just the selfless generosity of friends. So inspiring! A small kindness? That's easy. I mentioned on my blog that I was tired and grumpy, and a reader, a woman I had never met, emailed to say she'd like to send me a care package. I gave her my mailing address and a couple weeks later a package arrived. In it were books, wonderful chocolates, hand cream, and a HOMEMADE apron. I was floored. I was recently struggling with my new GF lifestyle - wishing that I could have all the easy foods I miss rather than having to struggle through their more complicated, time-consuming gluten-free counterparts. And my husband sent me a file of gluten-free menus from my favorite restaurants to make it easier for me to eat there. I don't know that it was any particular act of kindness that got a hold of me but we stopped giving gifts a long long time ago. In my family all of us, and I mean all of us have more than we need. Years ago one of my sisters-in-law sent us a flock of chickens, the following year a few sheep, this year a camel. Another sister-in-law started sending children, this year from Cambodia. All of these came to us by way of donations to really great organizations like http://www.heifer.org/ and http://goldenchildren.org/ . In this house we support lots of non profits like those who feed the hungry. We also support Tibetan non profits in the interest of maintaining and preserving cultural identity. In my own personal experience the gift of giving is one that just keeps giving, over and over. Even those with nothing can give something. Time can be far more valuable to a non profit or a stranger in need than any amount of money. I just wanted to tell you that, thanks to you, I've finally decided to buy a kitchen scale. Life has become so much simpler! I can finally cook out of the French cookbook that I received as a present this summer (all the measurements are in grams) and I don't have to make wild guesses as to how much brown rice flour I should be using... I just follow your suggestion of 60% starch to 40% whole grains. I love the recipes and the stories that flow along with them! The act of kindness that inspired me to give more and to generally be more kind, happened when our son was about 2 1/2. We had gone to the local Easter egg hunt, and were not prepared for the masses of children and adults who gobbled up the eggs as soon as the head bunny yelled "go!". The eggs disappeared like they were part of a hungry hippos game. I had stood on the sidelines as my husband helped our son with his basket. They were right in the midst of trying to gather eggs as well, however at the end of the scramble for eggs, they came up with an empty basket. My son was sad,and not quite sure what had happened and we were about to explain the ins and outs of egg hunts, when a lovely Asian man and his son turned to see his empty basket. Not really saying a word, they reached into thier basket and gave our son some of their eggs! My husband and I stood stunned and deeply humbled. A truly gracious act of kindness. I'm inspired every day by people in my church. People who are going through tough economic times who are still giving generously. It is a lesson I need to learn daily. It isn't about hanging on to what I have, but learning to give it away. That's why life is worth living. That's part of why I wanted to have kids! It isn't actually a small kindness, but what was a pretty big one for my family. My parents went through bankruptcy when I was in elementary/middle school. We received a few food baskets during that time which were of great help. Remembering this, last night I made a donation to my local food bank. I don't personally know anyone in need, but I know that they are out there. I might be a grad student, but I live relatively well, so I gave what I could and I hope that someone else is a bit more comfortable for it. Thank you for answering the question of "what on earth am I going to be able to make with the cookie press this year?" I think I'll make some today! I was just touched by an act of kindness two days ago. I had been telling an old friend about how many kids at my daughter's school deal with hunger. They've started a program to help these kids deal with hunger through the weekends, when they don't have free breakfast and lunch to get them through. On Sunday, my friend dropped off a card...with $100 in cash, and a note that said, "Use this to help those hungry kids." I am currently at the hospital on bedrest because my Valentine's Day baby is trying to come for Christmas. I just found out there is a Christmas party on my floor for the to attend that is thrown by a woman who spent months here and now returns every year to throw a Christmas party for all the ladies stuck here like she was. Its been 8 years and she lives in Texas, but she always comes back. That level of dedication to encouraging and loving on others inspires me to do the same. And your cookies look fab! I honestly, can't think of any "small" acts of kindness I do, because I try to do big acts of kindness all the time. It is finals time at my University, and a lot of people are feeling grumpy, crabby, and just over all, down. I walk across campus and smile to others and always hold doors open for others too. I also made little Christmas cards for all of my friends and burnt them each a CD with upbeat music to listen to while studying and doing homework! I looked at your spritz photo and thought you'd made flying spaghetti monster cookies. I quickly scanned your words to see a reference to him but was disappointed. So next time you make these, please promise you'll call them Flying Spaghetti Monster cookies and maybe add little circles for the eyes. And if you don't know the story, please please look it up, it is fantastic. Smooches! Just yesterday, I posted here begging for GF spritz, and--taaa-daaa--here is it! And, the timing is still great, since we decided to make choco-crinkles yesterday instead. (You can only bake so much in the gap between school-dinner-homework.) I will add almond extract to make these officially taste like my Grandma's. As I said yesterday: Spritz are the hallmark of holiday cookies for me. Thank you! I love your blog. I am ready to try the cannoli recipe. Yummy in the tummy. The small kindness I have recently taken part in had to keeping a fellow spouse company when her husband was deployed. I try to invite her out for lunch periodically so she isn't too lonely. I also believe no act of kindness is too small in today's world. Keep on baking those cookies and I look forward to more blogs from you. i work as a social worker in our local dept of social services, and the past few days, i've really been focusing on giving people the gift of time and energy and real contact. this may sound like a small thing, and something i should do all the time, with everyone. but the stress level and sheer numbers of humans passing through my cubicle can be so overwhelming that all i can do is protect myself by pulling back, breathing, and just doing my best. but the past few days? i've been stopping and looking people in the eye, smiling, listening to their stories without interrupting, not trying to hurry them along, even calling them later to check in on them. and the funny thing? the gift of love i was giving has turned into a boomerang and filled me with such love and sweetness and caring . . .
and you shauna, and lou, and danny . . . you help me in more ways than you can possibly know . . . i find time to read your posts during the day, bits here and there, and the wamth and goodness and Yes you guys crete sustains me as much as i know your delightful gf baked goods once i get a working oven again . . . much love to you . . . sending you well wishes of love and rest . . . The small act of kindess shown to me in the past week actually involves spritz cookies. I mentioned to a friend that I missed them and would love to try my hand at making them gluten free, but do not have a cookie press. I shared that I planned to convert a recipe and try piping the dough instead. The next time we saw each other, she handed me a bag. In the bag was her mother's cookie press, a vintage press with copper fittings and more disks than I knew came with cookie presses. It has been well loved and well used. I immediately tried using it, but the recipe I used was an absolute failure. Now I have a recipe that I know will work (thank you Shauna and Danny!) and a cookie press that makes me smile just looking at it. That's actually two not-so-small acts of kindness! I had a friend put together a gluten free cookie exchange. It was great because it saved all of us some baking. I brought your oreos (with pepermint filling), the snickerdoodles, and the jam tart cookies. They were all amazing. I appreciate the theory of helping people during the holiday season; however, I encounter people who seem to need help all year long. I try to do a random act of kindness once a week. There seems to be such a high number of people who simply need a hug, a laugh or morale boosting. It is an incredible experience to see a smile, and know you have made a difference. Growing up, my dad's family was dirt poor. They could barely keep any food on the table, let alone anything special. Here in Michigan, there is an organization called the Old Newsboys or better known as "The Goodfellows" who are former newspaper carriers who print a special edition and raise money for needy families. Children in the 50s & 60s received a box with a coloring book, crayons, nuts, an orange, and mittens. Children today will receive things such as socks, gloves, school supplies, and candy. My brother and I, once we were old enough to understand...started saving our allowance to give to the Goodfellows. We realized the difference it made in my dad's life as a child and we wanted to be a part of that. I will never forget the tears in one man's eyes when I was about 17 years old (and I had my first real job). He was collecting money for the organization. I handed him a $20 bill and he asked if I needed change. I told him "No, I don't need change. It's all for you, because if it wasn't for the Goodfellows, my dad and his brothers wouldn't have had a Christmas growing up." Because that organization touched my dad's life so profoundly, our family gives every year so that countless other children who would otherwise receive no presents have at least one gift for the holiday season. I read a blog of a lady who has discussed with her husband for years to buy a random couple a meal when they are eating out. To celebrate her 30th birthday they did just that. What a wonderful idea. One of the kindest things -or gifts- i have ever received was when someone gave a generous donation n my name to doctors without borders at a time when this was financially unfeasible for myself. Hooray! The spritz cookie recipe I've been waiting for. ALthough I attempted a batch of sprtiz cookies, using Betty Crocker's Christmas Cookie book spritz recipe as a guide and the GF flour mix from you lovely people. The dough was a little too soft, but the cookies turned out well. Although the cookies do not stay soft after they were baked and were very crumbly. Luckily I still have flour mix left. Can't wait to try this recipe! My favorite small act of kindness to commit is to make a meal for a new mama and her family. I do this whenever I have the opportunity. I know how much it helped me when I had newborns. I love spritz cookies! Thank you for these great recipes this Christmas! I live in N. Africa with my family (including my gf daughter) and one neighboring family is always bestowing us with kindness. They don't have much money but they are always giving generously of their food to us--traditional soup, etc. Their generosity has made me think to give a few more goodies or food items to people. Thank you so much for all of the incredible work that went in to transforming some of our favorite holiday treats into gluten-free wonders. Hope your Christmas was merry (and restful)! Definitely give GF a try. My little 10 year old son was having migraines 4 days a week for months. He was not a good student and the school had been telling us he needed to be on ADD meds. But our pediatrician was saying that he didn't need it. I finally decided that I'd get him tested for food allergies to see if something he was eating was causing him to not be able to focus in school. Lo & behold, the testing revealed he had both gluten and diary allergies. Devastating news for a 10 year old - no pizza or cheeseburgers. Within 5 days of going GF, we noticed his migraines were getting better - not as intense. Within 2 weeks, they stopped all together. Now he might get one or two a year. During this discovery phase, I went GF and diary free to support him. I still keep it up, as I've found my autoimmune is far less intense by avoiding it. All my pains in my wrist & knees (which i was attributing to getting old) went away!